Along with the rapid development of industry, decompression of hydraulic system on the first lesson of work put forward higher request, at present, the hydraulic system failure is due to have around 70% of oil pollution, in order to control the hydraulic system of pollution, except in the hydraulic system installed in the tube. For the new oil injection system needed by filtering pais, also used in hydraulic systems for fuel filter, oil circulation-filtering system. Fine filter for hydraulic systems, fuel systems, lubricating system and the pressure of hydraulic oil system for infusion or regular filtering. 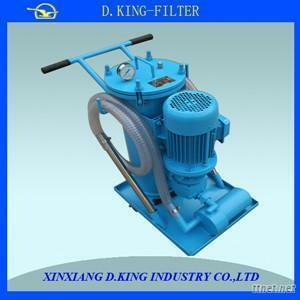 For dirty oil also has a certain economic effect, is the ideal energy saving equipment. Fine filter, oil filter in the deformed only impurities. The index of oil.